The DL-10 is a RS-485 remote temperature and humidity module that gives you real time temperature and humidity information at the same time. It contains an RS-485 communication interface and a sensor for measuring temperature and humidity. The DL-10 module supports Modbus RTU communication protocol for simple connection to many Industrial Control systems. DCON Utility Pro provides easy and convenient interfaces for users to configure the module. 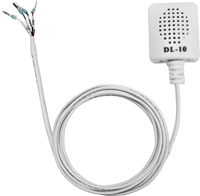 The DL-10's tiny form-factor, allows it to be installed in space constrained applications.